As impressive as it is to cruise through an Italian city in a Ferrari, doing so in Venice takes things to the next level. Meet Livio De Marchi, a man who didn’t let stuff like the city’s lack of roads and surplus of canals get in his way. 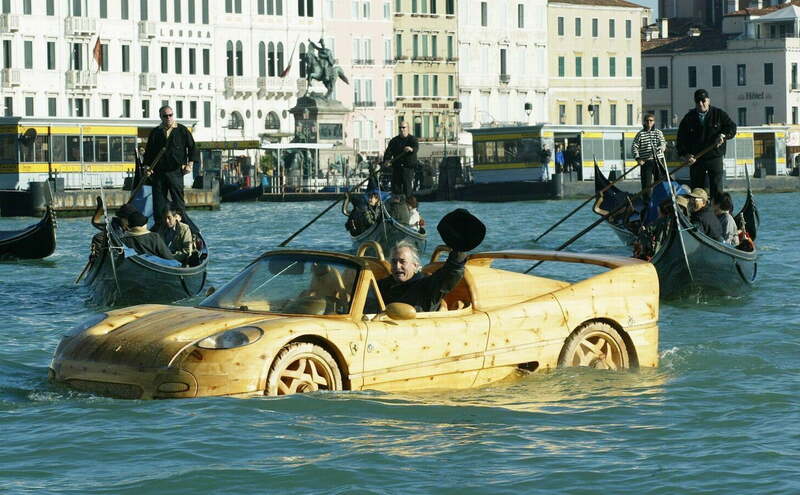 Made out of a block of pine, De Marchi spent five months carving a boat shaped like a floating Ferrari F50, right down to wooden wheels and the car’s distinctive air vents. The functioning left-hand-drive motorboat doesn’t have anything as substantial as the sports car’s 4.7-liter V12 engine, but it’s a step up from the paddle boat that he previously used to navigate the historic lagoon-bound town. “The Grand Canal has turned into a freeway,” said De Marchi to the Daily Mirror, lamenting the fact that the waterways of Venice weren’t as peaceful as they once were. Tired of being bullied by larger yachts and water taxis, De Marchi embarked on his floating Ferrari project. Granted, it seems like an unusual reaction to a little traffic, but Livio De Marchi is a bit of a local eccentric who’s prone to stuff like this. The Venice-based artist is world renowned for his lifelike wooden carvings, from hanging clothes to dachshunds, and even other floating cars. He’s previously floated down the Grand Canal in recreations of Cinderella’s pumpkin carriage, a wooden 1937 Jaguar and a Mercedes 300L gullwing. Suddenly, Venice’s famed gondolas are looking pretty mundane.